A ceasefire between Israel and Gaza terrorists, brokered by Egypt, has begun as of 1:00 (Israel time). Egypt has brokered a ceasefire between Israel and the Gaza-based terror groups. The ceasefire has gone into effect as of 1:00 a.m. (Israel time) Monday morning, according to a report on Kol Yisrael radio. Similar reports on Saturday and Sunday night turned out to be false. The ceasefire comes following four days in which more than 200 rockets and missiles were fired from Gaza into southern Israel. The rocket fire was met with Israeli airstrikes against terror targets in Gaza. Even after news of the ceasefire broke in the media, there were reports of sirens going off in the Eshkol and Hof Ashkelon Regional Councils. Rockets and mortars reportedly fell in those areas overnight Monday. 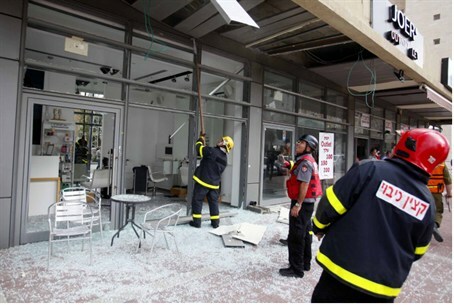 There were no reports of physical injuries and damages. Earlier on Monday evening Kol Yisrael cited the Al-Arabiya television network in reporting that the terror organizations have reached an agreement regarding a ceasefire. However, at that time there were no further details nor was there a confirmation by other sources. Kol Yisrael quoted a spokesman for the Islamic Jihad who said that the organization did not agree to any ceasefire and that one cannot be discussed as long as Israeli airstrikes in Gaza continue. Meanwhile, Egypt’s ambassador to the Palestinian Authority, Yasser Othman, said that he believes that a ceasefire in Gaza will be reached within 48 hours, despite Israel's refusal to stop the attacks on terror bases in Gaza. Kol Yisrael cited Othman’s interview with the Bethlehem-based Ma’an news agency, in which he said Egypt was determined to bring about calm in the region. Meanwhile on Monday evening, the IDF eliminated two terrorists as they prepared to fire a rocket into Israel from Gaza. The strike was the second in five hours targeting a rocket launching crew in Gaza. Previously, IDF forces killed two terrorists seeking to launch a rocket from the vicinity of a school in northern Gaza. Pilots reported bystanders who passed near the terrorists during the strike were injured in the strike. The IDF spokesperson's office said the incident was proof positive terrorists are using civilians as "human shields." IDF Spokesman Brig.-Gen. Yoav Mordechai told Army Radio on Monday the IDF is ready for a major ground incursion into Gaza.